Alex J. Cavanaugh: Major Ninja News! No, the Ninja Captain has not changed rank – I just have a lot of cool stuff for you guys today. First, I have the honor of a guest post at Melissa’s Imaginarium! Melissa is awesome in every way possible, so please visit her. And Thursday is her birthday! The Debutante Ball: Feast of Debut Authors continues! December 13 was Regan Guerra, December 14 is Melissa Pearl, and December 15 is Joseph Beekman. Lots of cool things to win! 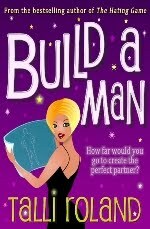 Our very own Talli Roland has a new book out – Build A Man! Yeah, I know you ladies would rather do that then deal with us… Talli is the most supportive and cutest English-Canadian you will ever meet, so go say hey! One of my most favorite blogger buddies, Yvonne Lewis at Welcome to My World of Poetry, has a new book -“Written From the Heart” Yvonne has worked SO hard on her second book and so many things went wrong in the process. Please stop by and congratulate her and check out her book!!! Voting is still open for The Movie 411 Awards. Once upon a time, Ray Bradbury was a struggling young writer in love with the craft. He wrote a short story every week, polished it up, and submitted it to a magazine. Rejection letters flooded in, mainly due to his prolific number of submissions, but there were also acceptances along the way, and they inspired Bradbury to keep doing what he loved: telling stories as only he could. This year, over 150 writers decided to follow in Mr. Bradbury’s footsteps by joining Write1Sub1. Some have written and submitted a new story or poem every week, and some have done so every month. So far, more than 40 participants have had their work accepted by over 100 different markets—from Twitter fiction to pro-paying, SFWA-qualifying short story markets—and we've cheered each other on every step of the way. But we've also been there to commiserate with disappointments and rejections, because that’s what Write1Sub1 is all about: community. We're dedicated to creating high-quality written works, and we're determined to submit them until they find good homes. It's never too late to join as either a weekly or monthly participant, and Write1Sub1 RELOADED is only a few weeks away: 1/1/2012! David Powers King co-founded Ink Pageant, a parade of blog posts for writers! We want to help writers improve their craft and reach their goals. We're not alone. There are scads of authors and aspiring writers out there willing to help each other, and they're willing to share advice through their blogs. We want to help bring it to you and make it easy to find. Ink Pageant has a few other purposes. You can share recommended reading or sell your books through your profile page; announce book signings, conferences, and other events; and share movie or book reviews. Most importantly, posts you submit can be put in front of an interested audience, benefitting them and bringing your blog a little extra traffic. See some good books? Ready to tackle Write1Sub1? Join Ink Pageant? Head about to explode from all the news? Now, go visit Melissa’s Imaginarium! Thanks for the write up Alex most appreciated also the other books that are on the market. Off to check Melissa's blog... I think you rate as an Author's champion, Alex. Free for a chat on my blog? This is the first time I ever heard about Write1Sub1 and Ink Pageant. Going to check them out now. Thanks for the tips and for the awesome news! Thanks for sharing all the news. I never heard of Write1Sub1. Thanks for letting me know. Yes, ready to explode from all the news. Some exciting opportunities out there. Now, onto vising everyone you mentioned. Thanks Alex! Ciao! Yvonne, you're welcome. Couldn't find a link to purchase - sorry! Glad to lead everyone to something new today! Write1Sub1 sounds awesome. Get that stuff out in the world! Write 1 sub 1 sounds awesome. I'm not sure I'm ready for that kind of commitment, but I do think I'm going to try to write more short stories next year. Maybe that 1 per month you mentioned, is that write 1 sub 1 lite? Wow, that is a lot of great Ninja news. Awesome. Congratulations to all with new books. I will check them out. Write1Sub1 sounds terrific. The more you put out there the more likely one will be accepted! The Ninja army is on the move! all about the journey... i mean rush. great job on the q and a, i love the fact you are a real person not some robot... much success. Wow, this a feast of awesome sauce right here. Spectacular news all around. And thank you for being at the Imaginarium today. You rock, oh Captain, my Captain! Cool news, Alex, thanks for the wrap-up :-) I joined W1S1 but I'm embarrassed to say it fell by the wayside the past 2 months. Must get back in gear! I'll pay a visit to Yvonne - didn't know she was having so much difficulty, glad she stuck to it and the book is out!! Great info on Write1Sub1! I was planning on writing a short story a month starting in January. Rusty, Write1Sub1 lite sounds perfect for you. Jeremy, most robots don't have a thing for Kate! Lisa, I'm glad she did as well. Tara, Ninjas always on the job! Cap'n Alex!! My brain has just exploded from all these activities! I need to lie down somewhere dark...! p.s. YAY for all these fab happenings!! Melissa's really fun and lively. Thanks for all the great links, Alex. I'll be doing some roaming from here. Alex , the gremlins are playing up at Amazon......more problems but should be sorted out by the beginning of next week. That's a lot going on! Thanks for all the links. Write1Sub1 is such a great idea, and I've been observing Milo's success with it all year. Very cool. Wow. Lots of stuff here. Thanks. Kitty, no! Take some aspirin, you'll be all right. Suze, you are are rare, awesome woman! Lot of info here, I think I will have to take it in small bites. Thanks for taking the time to share it with the rest of us. Alex,can you share a bit more about W2S1 Reloaded at the BBT Cafe? I'm thinking some folks over there might want to join in 2012 if we have our own short story anthology. The more practice the better! I went to the blog but don't really see specs for 2012 yet. Look at all these great news! A particular CONGRATS to Talli and Yvonne on their books - they're lovely ladies and deserve it! A short story a week. I remember reading that about Bradbury. Wow, but what a great idea if you could do it. This is great news! Best wishes for Talli and Yvonne with their new releases! See you over at Melissa's blog. looks like I have some blog visits to make. Thank you for the Ninja News, LOL Hugs!! Hey Alex! Thanks for the W1S1 shoutout. We're working hard to gear up for 2012 and we hope to get lots of participants! There is so much going on in the blogosphere every day that it is challenging to keep track of it. I love that I can visit your blog and get the scoop on basically ten different things. It definitely makes clicking on Alex Cavanaugh worth while. I'm off to read your interview. A mindful of information, I’ll have to pop over more often. Where do you find the time? Wow! You always have so much to share. Thank you! Lots to go check out. I got to meet David at a writing conference in October. Great guy and very supportive. And isn't Elizabeth's debut ball a great idea? I need to check out Yvonne's book. Great set of announcements there. That last almost makes me wish I wrote short stories, but I just really don't, except the occasional drabble. Best of luck to all these people with debuts! Who, that's a lot of news. I'm heading over to the Imaginarium to see what you have to say. Write1sub1, cool! I'll have to go check it out. Dani, I'll copy and paste what I have, but otherwise I'll have to contact Milo. Charles, Milo does which is amazing. Stephanie, excellent! Might need to get some more details from you. Laila, as I find things, I copy them into Word. Often people send me the information! Michael, somehow I've become the news guy! David, you're welcome. I need to join myself - not that I have many writing tips! Great information! Thanks for the round up. Ink Pageant looks interesting, and I'll probably check out the poetry book. That's a lot of great news! And what did I glean from it? Talli is an English-Canadian... I knew I liked her. Thanks for all the great info. I'm going to check out the links now. I'm going to check out Melissa's Imaginarium for sure. And David's Ink Pageant sounds intriguing as well. So many links, so little time! Talli is a sweetheart. Two books released in one day! Thanks for the news. The Movie 411 awards are heating up man! You may win this year, but watch out next year! Maurice, you will win next year, because this will be year two for me and I won't let my blog into the running a third year. Besides, I feel bad - I nominated your site! I like the adventure in finding a good man rather than building one! Great interview on Melissa's blog. Oh my, there is so much going on. I'm off to check out your post on Melissa's blog. I LOVE her blog. She is so sweet. Christina, and we thank you for that! I'd love to do that Write1Sub1, but I don't think I have a shorty in me. I'm way too long winded! So much great news! Love the idea of a Debutante Ball. Thanks for catching me up, Alex! There's so much helpful news here I'm printing off your post and saving the link too. I definitely need to check these places and people out in the next couple evenings. Thank you for this. Yes, Melissa is impressive, from time to time pass through his blog. Wow! So much writing going on and so many books out. Great news all around. Write1Sub1 sounds challenging. I used to write short stories all the time. Wonder if I still can? Great links! Thanks for the info. Loved your interview Alex; and I bought Talli's book after reading an amazing review on Daily Dodo's blog. I would love to join W1S1, but I lack the dedication to that much writing. Milo is an inspiration, however and I've set a goal to attempt at least two short story publications a year. Means I have to write one at least every couple months . .
Nancy, I should, since my novels are so short anyway! Cate, it was all Elizabeth's idea. Helena, thanks! Just trying to stay on top of things around here. Don't want to lose my Ninja status. Thanks, Donna! And Milo is an incredible inspiration. I'm off to check out your post at Melissa's. Lots of great news and links to visit! Congratulations Yvonne, and Happy Almost Birthday Melissa! I'll head over soon. So much cool news here! I'm amazed at what Milo's accomplished. He's had an incredible year. Jennifer, he's had SO many short stories published this year. Blows my mind. Alex some day I want to grow up and be just like you and the other gang of writers you hang with. Milo's stuff is good for sure. An amazing amount of info Alex. Thanks for that. Love Melissa's blog. Very interested in Write1Sub1. Love the author feast. Lot of new literary talents. BIG thanks for the W1S1 signal boost and shout-out, Alex! You have more awesome followers than any other writer/blogger I know. For those of you interested in climbing aboard the Write1Sub1 train, visit our "About Us"
if you have any questions. 2011 has been a great year, and we're really looking forward to 2012. Not ready to tackle W1S1, but I'm in awe of those that have! Wow, all these great places to visit and so little time. Another great post, chock full of good information. I will definitely check out Write1Sub1. I don't think I've seen this site yet. Thanks for the advice on the bloghop! Hi Alex .. great shout out for all - Talli's done so well this year .. Yvonne's release of her new book - is just great to know about .. Then the Write1Sub1 ..sounds an interesting project to be involved in. Thanks for this overview of all the great things going on, Alex. Most of the sites I'm not familiar with, so will go check them out. MsMariah, looking forward to your blogfest! Geez, Alex, so many tasks ... just thinking about all this has induced a nap taking frenzy. Thanks for all the links and info! Appreciate how you keep us informed! I must say man, you sure know how to fill 'er up, pack 'er down and heap a post over the top!!! Thanks for all the wonderful references Man! God bless ya and have yourself a fantabulous day!!! Just the idea of writing/submitting one story per week makes my blood pressure rise. It's a fabulous idea, though. Liz, I just get around! Yeah, that sounds bad, doesn't it? Christopher, sorry I wore you out. Nezzy, Spellchecker is wrong anyway! Joshua, somehow Milo does it. Definitely a lot of interesting news, Alex. Thanks for the updates. It is interesting that to build a man, I find that some women can get. So much good news. Thanks for the history of Ray Bradbury. Certainly, good practice for all of us. Write on! Dude! This is such awesome info - thank you! *scroll, scroll, scroll* I really need to remember to jump in here the minute you post, Captain Ninja! I'm excited to read Talli's book. She's great. Happy Birthday to Mel! She's the most amazing woman I've met in my life and I love her from the bottom of my heart! Lots of great news! I'm so behind on so many things. I have to get caught up now. I love visiting your blog, Alex. There is always something new and exciting to find. Happy birthday to Melissa Bradley and congrats to everyone with the new books published! I'd never heard of the Write1. Thanks for sharing!!! So many cool links! Thanks Alex, and thanks for following my blog! Will go check out Melissa's blog now. Angela, I try to make it exciting. JC, sorry it slipped through the Google cracks! Oh my. So much happening, my heads about to explode. I can't keep up. That's it! I'm getting a clone. OMG, all this news! Thanks, Alex. And geez, I'm comment number 112? Holy cow, you're a popular guy. You are so amazing Alex. You really, truly are. And the best part is that you don't even know the half of it. You are incredibly supportive and everyone really appreciates it. I love poetry Yvonne's book, Welcome to My World of Poetry, can be very interesting. Greetings. Miranda, if you do, let me know where you got it from! Jennie, thank you so much! That really made my day. Thanks for visiting Toads ;D and your kind comments! Sage advice as I hang head in shame...I thought I was following you, but I was just following your comments around other people's blogs.